I NEED TO READ IN ALL CAPS. SMALLER PRINT IN THE NEWSPAPER. SO I MADE AN APPOINTMENT TO HAVE MY EYES CHECKED. 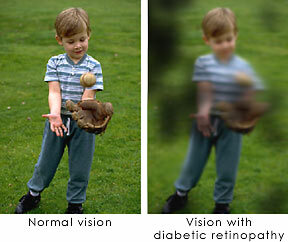 I WAS THEN SENT TO AN EYE CLINIC AND THEY TOLD ME I HAD DIABETIC RETINOPATHY. THEY THEN BEGAN TO LASER ONE EYE AND GIVE A LUCENTIS SHOT IN THE OTHER EYE. IT HAS BEEN 9 MONTHS NOW AND SLOWLY I CAN SEE SOMEWHAT BETTER. I ASKED THEM HOW LONG TILL I COULD SEE BETTER. THEY TOLD ME IT TAKES TIME. IT'S GOOD I WENT WHEN I DID SO THEY CAN HELP ME.